Wild, wild horses. It was equal parts beautiful and terrifying when four illuminated white horses stampeded into the Cavalia landscape, and at times appeared to be coming straight toward the audience. Thundering hooves synchronized with the inevitable pounding hearts of the audience, who at this point, were already enthralled by the power of these amazing animals. This was my experience, at least, as I sat only meters away from some of the most gorgeous creatures I had ever seen. Fear and surprise was quickly replaced by awe; something that would repeat itself again and again as the show continued. “Don’t do that, please don’t do that,” my mother muttered under her breath nervously, as a rider prepared to swing himself in full 360 under his galloping horse’s belly. It was a trick that would make Legolas see green, but he made it, and the audience exploded in applause. Trick after trick had us holding our breaths in anticipation. 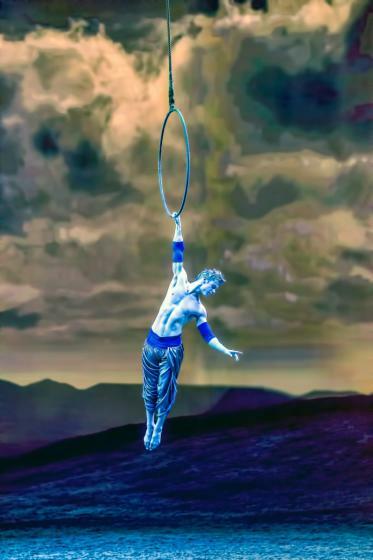 Higher and higher acrobats went as they swung effortlessly on hoops; all while lightning and images of striking landscapes flashed through the big top. “There’s just something about a man on a horse.” Don’t moms say the darndest things? While there was no shortage of very fit and gorgeous individuals with out-of-this-world performances in the show, my love went to the horses. And how could it not? 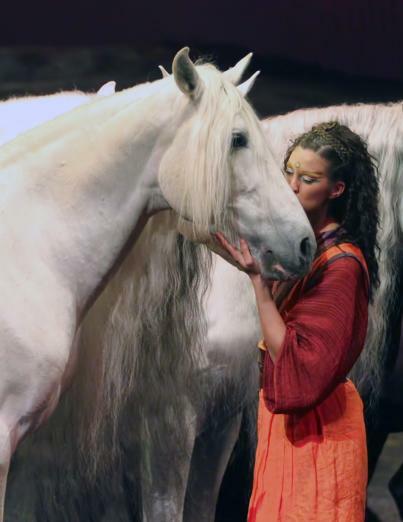 A duality of friendship and love is at the heart of Odysseo. In fact, one must assume that tightly knit relationships are a necessity when pulling off a show of this magnitude. 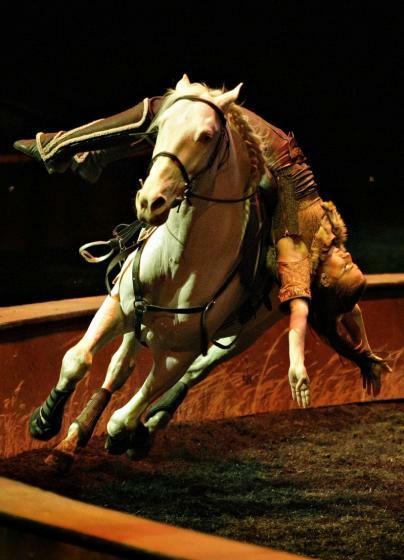 The performers effortlessly show you their incredible relationship with their loyal companions, and in turn, the horses have their own way of displaying emotion and connection in return. 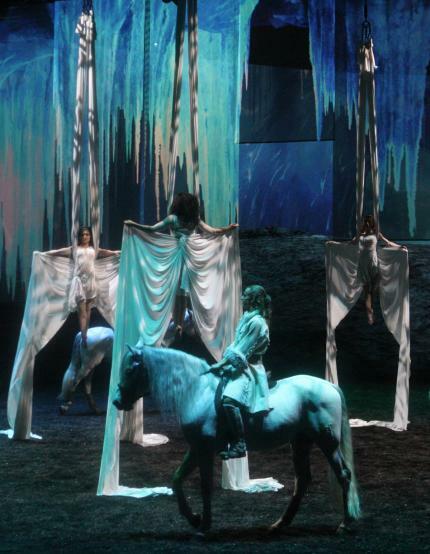 While the true meaning of Odysseo is still a mystery to me, the theme of love was prominent. The theme seemed especially evident in the haunting carousel scene, where dancers moved together and apart again as phantom horses stood frozen in time below, leaving the audience yearning for more. With love comes loss. 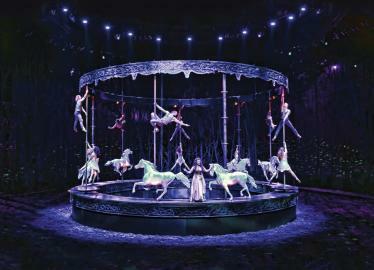 Odysseo teetered between optimism and melancholy; the perfect contrast that had people leaning forward in their seats. 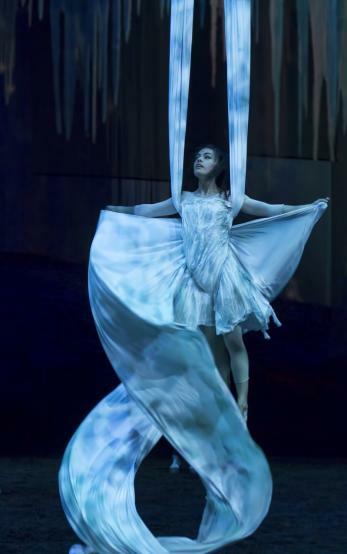 The angelic ribbon acrobatic sequence seemed to symbolize the act of holding on, and ultimately letting go. Deep blues mirrored the darker sentiment of this scene, creating moody imagery as white horses circled the women who twirled in flowing ribbon above. This, combined with heart wrenching and poetic music composed by Michel Cusson, set the stage for a deep heartache. This was not a feeling to dwell on. The light at the end of the tunnel was the hope that this heartache would ultimately lead to greater harmony. It was not until after the chanting was through that the English translation of this Susu phrase was revealed: No more war on Earth. Odysseo is a show of love, friendship, dreams, freedom and hope. And it’s not one to miss.